President Trump's nominee for Attorney General, Bill Barr, told lawmakers during his confirmation hearings on Tuesday that he was "shocked" after reading anti-Trump text messages between former FBI employees Peter Strzok and Lisa Page, and that he had never heard of the FBI launching a counterintelligence investigation on a President based on a political decision, as was reported last Friday by the New York Times. 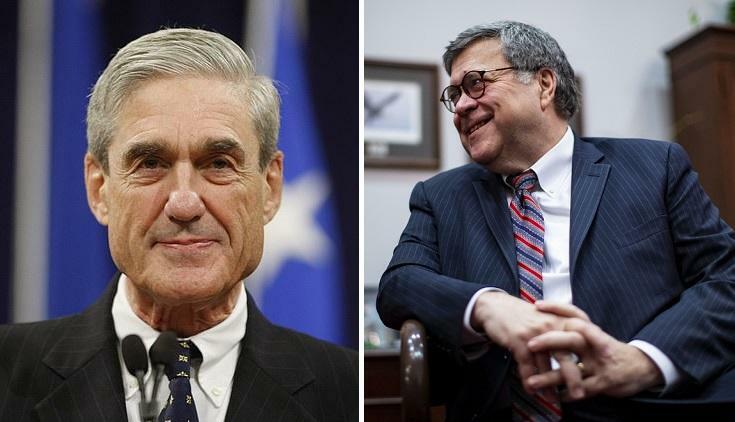 When asked about the Special Counsel investigation headed up by his "best friend" Robert Mueller, Barr said "I don't believe Mr. Mueller would be involved in a witch hunt," and that "On my watch, Bob will be allowed to finish his work." Barr: "I don't believe Mr. Mueller would be involved in a witch hunt." Barr also said that the Trump administratin would not be allowed to "correct" the Mueller report before a public release, stating "That will not happen." Barr: "I believe the Russians interfered or attempted to interfere with the election, and I think we have to get to the bottom of it." AG nominee Barr describes "brief" June 2017 meeting with President Trump in which he says Trump asked: "How well do you know Bob Mueller?" Last week Sen. Lindsey Graham (SC) met with Barr, and said that the AG nominee has a "high opinion" of Mueller, and that Barr told him that he and Mueller worked together when Barr was Bush's attorney general between 1991 and 1993 when Mueller oversaw the DOJ's criminal division. Graham added that the two men were "best friends" who have known each other for 20 years, and that their wives have attended Bible study together. Mueller also attended the weddings of two of Barr's daughters. Graham listed a series of questions he put to Barr: "I asked Mr. Barr directly, 'Do you think Mr. Mueller is on a witch hunt?' He said no. 'Do you think he would be fair to the president and the country as a whole?' He said yes. 'And do you see any reason for Mr. Mueller's investigation to be stopped?' He said no. 'Do you see any reason for a termination based on cause?' He said no. 'Are you committed to making sure Mr. Mueller can finish his job?' Yes."